1For ages 10 and above, this course is aimed at beginners with little experience. 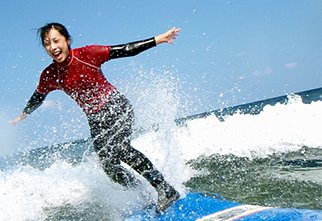 Forget the impression that surfing is difficult, with SeanaSurf 90% of participants can ride the waves! 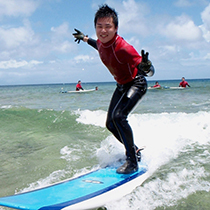 For ages 10 and above, this course is aimed at those who want to learn to surf.SeanaSurf offers courses tailored to beginners so that those with little experience can enjoy themselves. As there is no upper limit on the age of participants, a wide range of age people are safe to enjoy themselves. From small children to seniors, there are courses available to suit all ages. 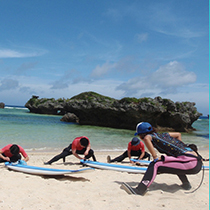 ※Participants must be aged 10 and above, and in good health. ※Those who have consumed alcohol, are in poor health or pregnant are not able to participate. ※There are also some instances where those with a prior medical condition are unable to participate. Swimwear (please wear in advance), towel, sandals, and lots of energy! Please confirm the schedule on the menu page. ※ Both "マップコード" and "MAPCODE" are registered trademarks of the DENSO Corporation. ・Staff can provide support with a basic level of English. ・At the latest, please contact the shop to confirm by 17:00 the day before. ・When confirming, please provide the height, weight and foot size of all participants. ・When making a reservation, please provide the age, gender, height, weight and foot size of all participants. ・Those who have consumed alcohol, are in poor health or pregnant are not able to participate. ・There are also some instances where those with a prior medical condition are unable to participate. 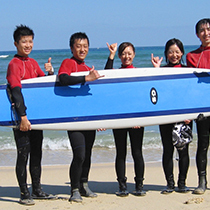 Present the coupon to receive 700¥ off any course at SeanaSurf. Only valid for 1 person. Please present either a picture or a print out of the coupon.